Looking for that fresh “April” scent found in fabric softeners when washing your clothes and your pets blankets, beds, and toys? Hang them outside to get the real spring scent, but steer clear of most commercial fabric softeners and dryer sheets. Why? 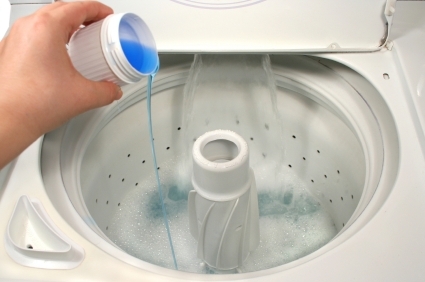 Here is a list of some of the ingredients used in dryer sheets and fabric softeners; do ANY of them sound aromatic? Cleaning products are pretty much unregulated because there is an assumption by the manufacturers that these chemicals do not get absorbed into the body. In reality, everything that touches the skin finds its way into the body via the bloodstream. This is true for both humans and animals. Many years ago my cat Katie, healthy until the installation of new carpet, died directly as a result of breathing in and walking on the new carpet, and inhaling and absorbing the gasses put off by the carpet fiber, chemical treatment on the carpet, and the carpet glue. And did you know that dryer sheets create toxic fumes when released with heat? Or that their inert ingredients can cause cancer, liver disease, Alzheimer’s, and lots of other chronic disorders? Probably not what you had in mind when you poured in the liquid softener or tossed that sheet into the dryer, is it? So if you or your pet is scratching, has a rash, is acting unusual, or there is a health issue that appears to have no cause, look into eliminating dryer sheets and fabric softeners from your laundry practice. Or simply eliminate them altogether as a preventative measure. Keep you and your pets safe – check out these sites, and others like them, to find safe alternatives to safe, fresh smelling, and static-free laundry. Or make your own, using Dr. Bronner’s Castile Soap. For help with possible poisoning, contact the One Green Planet pet poisoning hotline, here. Click here to learn all about me and what inspires the blog. Donate kibble to dogs and cats, and have fun doing it. Sign up for a daily reminder. Donate food with your daily click. Sign up for a daily reminder.